” I wasted a lot of time,” confided a long-time friend as she described the years that she had not worked outside the home. She and I were having a conversation about her decision to return to work. At the time she had three high school aged children. The dialogue stayed with me. A recent conversation got me thinking about this ‘wasted time’ exchange. A friend was out and about with a visible kick to her step. She has been caught in the melee of re-organization that is currently underway at the American Red Cross. If you aren’t familiar with it the organization is currently undergoing a restructuring of redundant geographical territories. Net net it translates into new organizational structures, new bosses, departures of long-serving employees, etc. You know the drill. Anyway, I noticed a giddiness in her that I too rarely see. Turns out that the euphoria was created by a conversation during which she exercised HER OWN AGENDA. I think this was the first TRUE time that she did such a thing in her professional career. Here is the story. She was having a conversation with her potential new boss. The boss presented completely new ideas for her role and the structure of her work. She had been one of the lucky few who up-to-this-point had an enormously flexible schedule. Anyway, the conversation really pushed my friend beyond the limit. She wasn’t thrilled with the content of the proposed new position nor the lack of flexibility it presented. With great composure she responded by articulating HER agenda — a role that was significantly different from the one being proposed and a structure that fit HER needs. To my friend’s astonishment the new boss immediately began working with the altered concepts. By the meeting’s conclusion the new boss seemed to work my friend’s ideas into the overall view-point for the new group. In looking at my two friends, “wasted time” and “Red Cross”, I’d say one thing: do you have an agenda? I’ve come to think about agendas very differently through my career. I’m not talking about job responsibilities. I’m talking about the set of priorities that you are working on. All you. For a long time I allowed my job to be my default agenda — that was the workaholic self that I sported for so long. Here is something that makes me laugh now but truly amazed me in the moment. BTW, I’m going to over-generalize here a bit — please stay with me. Men always know their agenda. Are you still with me? Not only that but I’ve been amazed at how quickly men can re-calibrate their own agenda based upon what is being said in conversation. My data set here is what I observed over the past 4+ years as a C-suite participant at a Fortune 500 company. I was the only female on the team. “We’re buying a company.” “We have new sales or profitability numbers to hit.” “We have to refocus the division.” Almost instantaneously my gentlemen peers knew how any of these phrases affected THEIR plans. I’m not talking about their job responsibilities. I’m talking about a personal agenda and an ingrained ability to calculate the win/loss for themselves from every conversation. Have you ever noticed this? Am I alone in this observation? What’s your agenda? Sounds negative. Is it self-serving? It isn’t intended to be. What is an agenda? From my perspective it is a simple recitation about what you are about NOW. Family, job, education, community, extreme combinations of any of these. Whatever. No judgement. It’s your agenda. By the way, I’m not advocating any one agenda model — the instant recalibration version or any other. What I am asking is whether or not you have one. Remember our Summer Book Review #5 by Eleanor Roosevelt, “we should be able to realize that making up our minds as to what gives us the greatest amount of pleasure and then working for it, is one of the (great) satisfactions of life. Drifting along is too easy to do.” (It’s up to the Women, pg 9). Let’s not risk wasting any time. Truth be told you guys are a part of my evolving agenda; Novofemina. I’d love to continue to grow it. I need two things for that. Your thoughts and readers. I often imagine you reading the blog with an occasional smile on your face. Am I dreaming this part? Please take the time to comment. I’d love to hear your thoughts: good, bad or indifferent. Also, please ask a friend to check us out. Next week is post #25! For those who read regularly, thank you. Hope this post helps you in thinking about your own agenda! I know Novofemina is helping me with mine. 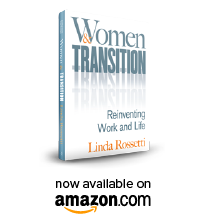 This entry was posted in Observations on Transition and tagged career transition, career transition issues, novofemina, observations from a women's transition, observations on transition, personal transition, women's issues, women's professional transition, women's transition issues, women's transition process. Bookmark the permalink. OK, Linda, I will write later, but my “agenda” at this very moment is to get the kids up and off to school on time with a degree of confidence. Will write more later! This is great stuff! Yes, it makes me smile and yes, it rings true and yes, we should all have an agenda! Keep up the good work. I find myself deep in thought – and smiling. I religiously read the blogs and almost always associate with the content. However, my agenda these days has two major bullet points and two only – my family and my job – which leaves me little time for anything else. But I do log on to my computer weekly and look forward to reading Linda’s magical words. I work full-time for a financial services firm, commute from the burbs daily to Boston, and strive to spend every free minute of my time with my 8-month old daughter (why do I feel like I missed so much of the precious baby days? ), my 4-year old son (when and how did he learn to speak Spanish?) and my supportive husband (who also works full-time in an intense job). I think of new approaches/ideas when I read these blogs. I have not moved to implementation stage, but the wheels on the bus are starting to go round and round, and i am making slight progress towards more balance. I’ll be sure to share any insights when I get there. Thanks, Linda, for your help along the way, and for prodding me to post a response. I think about it every week, but……I don’t find the time! Working on this! I think perhaps life necessitates more than one agenda, probably (at least) one of – to reiterate – Necessity, and one of Desires. The Desires Agenda is mainly geared towards Wants, and these examples are already listed in the above paragraph. But in order to have my Wants fulfilled (since this is about agendas), there is also an element of Necessity involved. To have that dream job, the perfect smile, and that cool car, I MUST work.